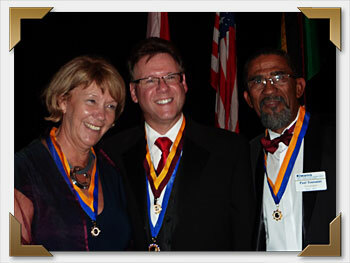 The Kiwanis Foundation of Canada has, therefore, brought into existence an award, which honours one of the founders. 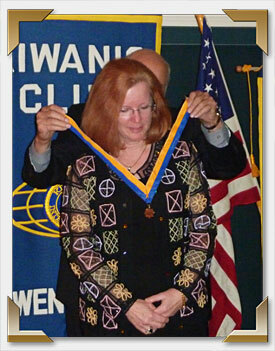 This fellowship consists of Kiwanians and others who have contributed to the growth and work of Kiwanis. Their service and dedication is remembered and honoured by their being named to this prestigious society. The Foundation sends a special scroll honouring their contribution and the uniquely designed medallion. You have an opportunity to continue to honour your Mel Osborne Fellows by providing them with a Diamond Mel Osborne Fellowship for their continued service to Kiwanis and the community they serve. The Diamond Fellowship has a distinctive coloured ribbon and a new diamond pin, which indicates the number of diamonds each fellow has received. Mel Osborne Fellow: The basic level is available with a donation of $750.00 and the recipient receives a scroll, the Osborne Medallion with a gold and blue neck ribbon and a lapel pin/tie tack. Diamond Level One Fellow: With a second donation of $750.00, the recipient receives a second Osborne Medallion encased in a shadow box, a gold/burgundy neck ribbon and a special diamond pin. Additional Diamond Level Awards: With additional donations of $750.00 (each) the individual will receive a new tab with a number which will indicate the level the Diamond Fellow has reached. Clubs may apply for a Mel Osborne Fellowship, in a Shadowbox format, to be presented to any non Kiwanis member in their community for a donation of $350. This is available to any Club in Canada once each year. It is most important that donors identify the recipient of the award and that their particulars be clearly set out in all correspondence (name, address etc). The name should be correctly spelled and any other text you wish added to the scroll should be shown, so that the order can be properly entered with the name and club if a Kiwanian. If you have an intended date for presentation, be sure to include it as well as a phone number contact from your Club. To apply simply send the above information by Email or Canada Post to the address shown at the top of this page. Cheque or Credit Card accepted. * Donations to the Mel Osborne Program are not considered eligible donations for other Foundation programs.